Don't turn GREEN - Go GREEN! Our occupied owl boxes bring so much joy and amazement to our participating members and their families, while our unoccupied owl boxes often bring disappointment and despondency. We understand that. With over 100 occupied EcoSolutions owl boxes on our database, we feel that we can find correlations between our owl boxes and their occupancy. We collect data from all of our owl and bat boxes. We look at height, orientation, design, placement and we work towards both an owl and bat box occupancy blueprint. All of this data and its interpretation can be found on our website here. Our aim is to encourage our participants to become involved in our successes, our findings, and our Owl Box Project. 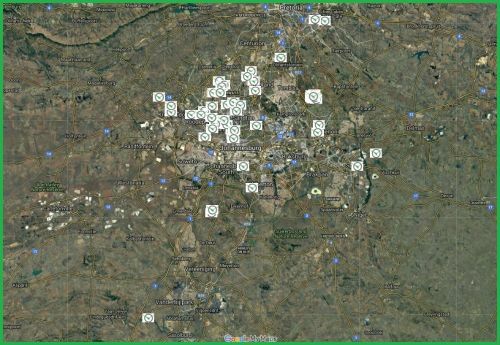 Below is a map showing the location of our occupied owl boxes in Johannesburg. The key to the success of these owl boxes is not height, placement, orientation, moon cycles, connections in the government, it is simply - service and maintenance. The annual replacement of the substrate is essential. To see what the service covers and entails please follow this link. The map provided is interactive. You can click on the owl box locations and read their story. You can look at the closest occupied box to your location and you can read up on owlets and their ringing. We hope that these success stories inspire and delight you. We also hope that you will fully embrace the potential of your own owl box by giving it its annual service. You can arrange that easily - just click here.